Published by Joshua Clare-Flagg on 26 Jul, 2013. 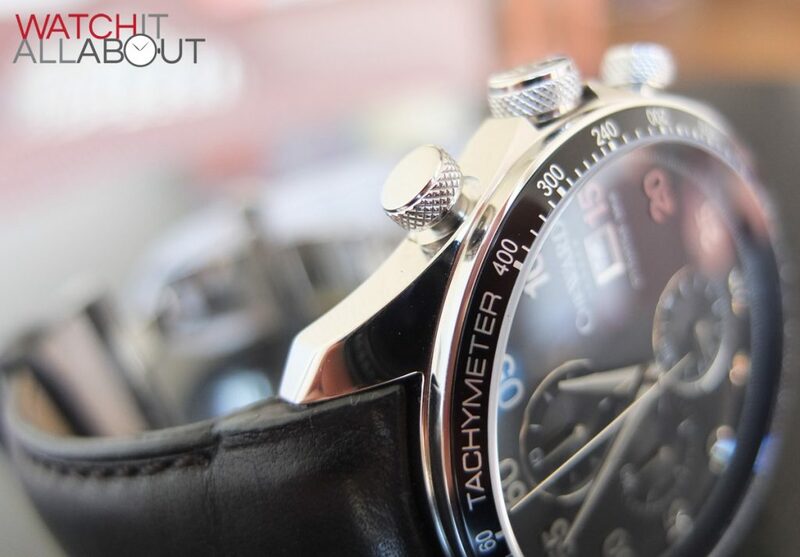 The Tag Heuer Carrera is one of the most popular luxury watches available. Unfortunately, the £2k+ price tag makes it out of reach for many of us. Thankfully, though, we now have an amazing looking and stunningly built affordable equivalent. 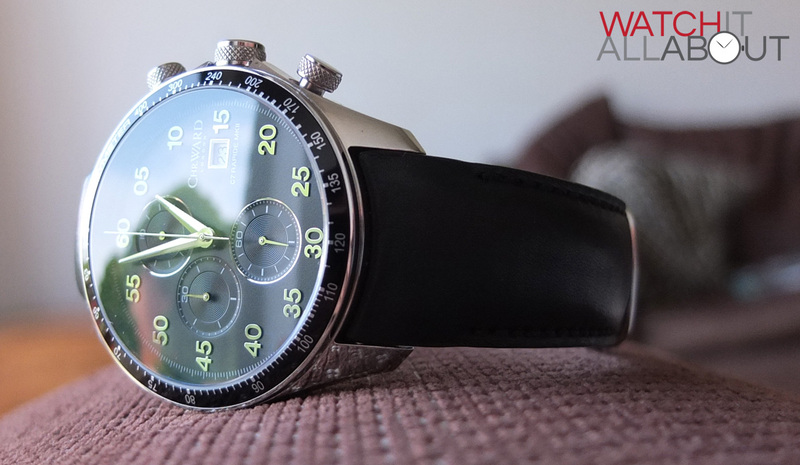 The Christopher Ward C7 Mk2 was released as a replacement of the mk1 (duh) with some serious design alterations. Personally, I think the Mk2 wins hands down, as the Mk1 never really did much for me. But anyway, for £300 what do you get? Can it really be compared to the Tag Carrera? Let’s find out. 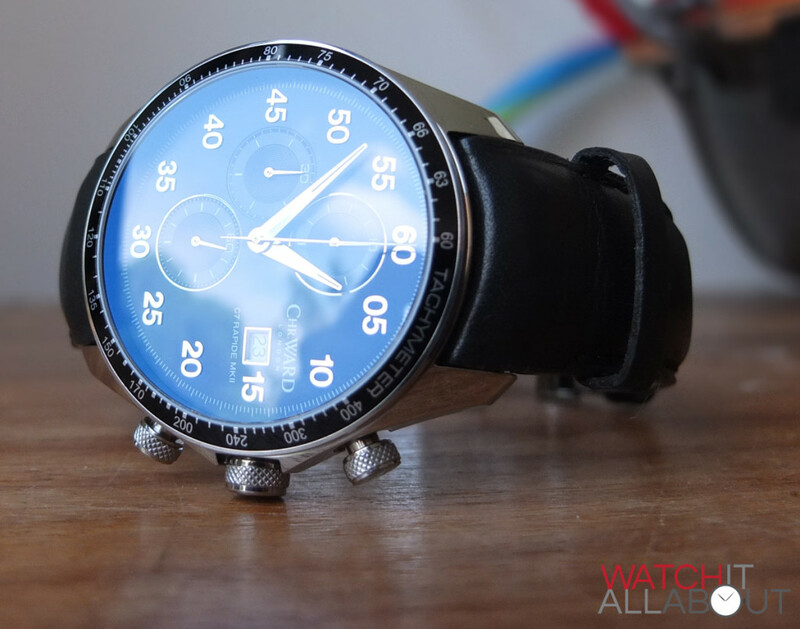 The case is 42mm wide and 10.7mm tall, and is all 316L polished stainless steel. It is perfectly finished as you would expect, with no flaws anywhere. 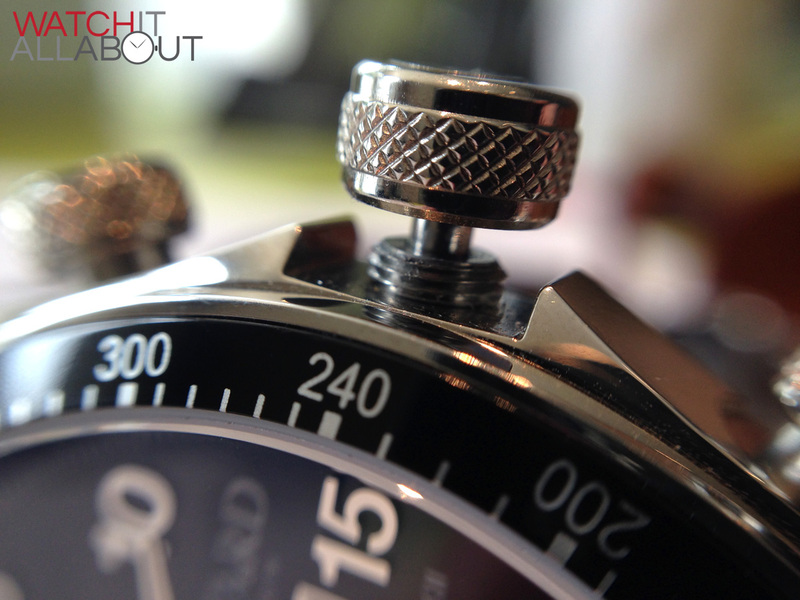 The screw-in crown and chronograph pushers share a similar style to each other. The pushers have a thin shaft with a large oversized top with a great grip crosshatch texture going around the side. The crown also has the crosshatch grip, which makes unscrewing easy, with polished borders at the top and bottom. This is a nice touch and is definitely your better than usual finishing, which is apparent across the whole watch. 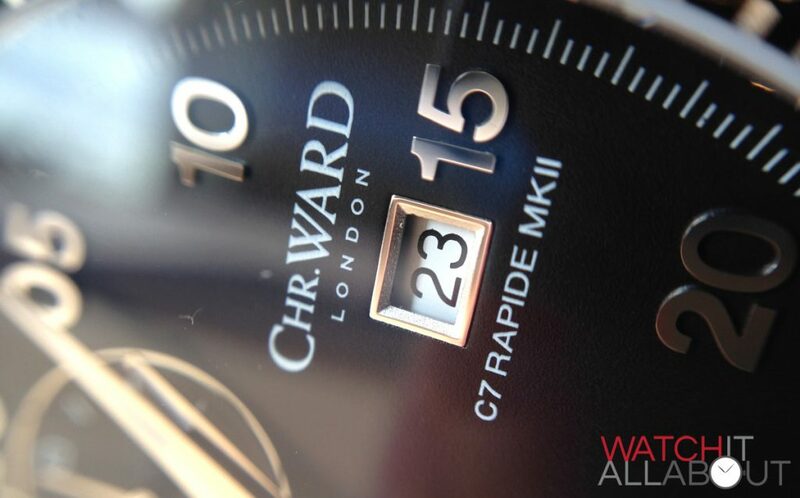 Christopher Ward have really put a lot of effort, time and finishing into the C7 mk2. The crown has the CW logo embossed in the end. The screw-in case back is a brushed finish steering wheel with the CW logo in the centre, with a polished border around the edge of it and matt sections in background between the steering wheel sections. Although it may look quite plain, the variety of finishes make it interesting and feel and look high quality. 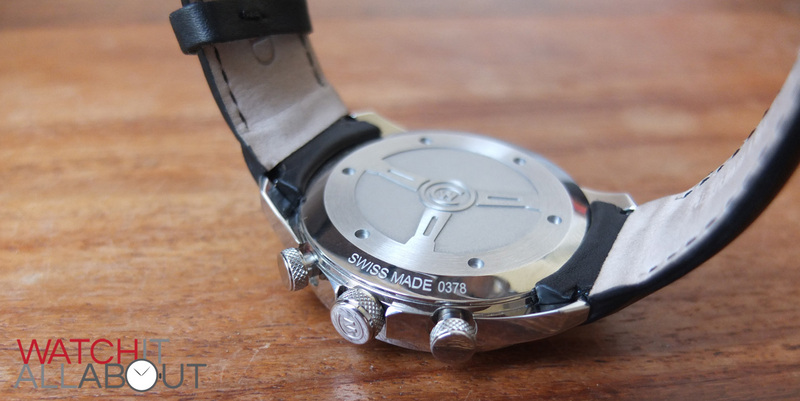 The only text on the case back is “Swiss Made” and the serial number, both which are very deeply etched at the bottom. Nuff’ said. On the front of the watch is a sapphire crystal of course (no Christopher Ward watches have anything but) with a good layer of AR on it, giving it a lovely blue sheen when you catch the light right. It is slightly domed, which increases the visibility of the face at a sharper angle. The crown guards are very small so they don’t take away from the design feature of the crown. I like the way they have a tiny cut out angle at the back of them both (the case back side) al- hard to explain, but stops the crown guards having an abrupt end at the crown. Just another little thing that shows the time and amount of machining that has gone into this great watch. Thankfully, the bezel has been updated from the Mk1. The Mk1 had black paint right up to the edge – and was greatly susceptible to marks and chips. Now though, the Mk2 has a steel rim around the outside of the bezel. Having this as a protection, it reduces the ability to easily mark, scratch and chip the bezel itself. 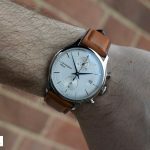 I also think it adds to the classy appearance of the watch, as it is another nice little extra finish which makes it look more expensive than it actually is. 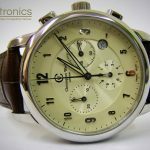 It has a printed tacymetre around the bezel, and due to this it is not rotational. The printing is perfect. 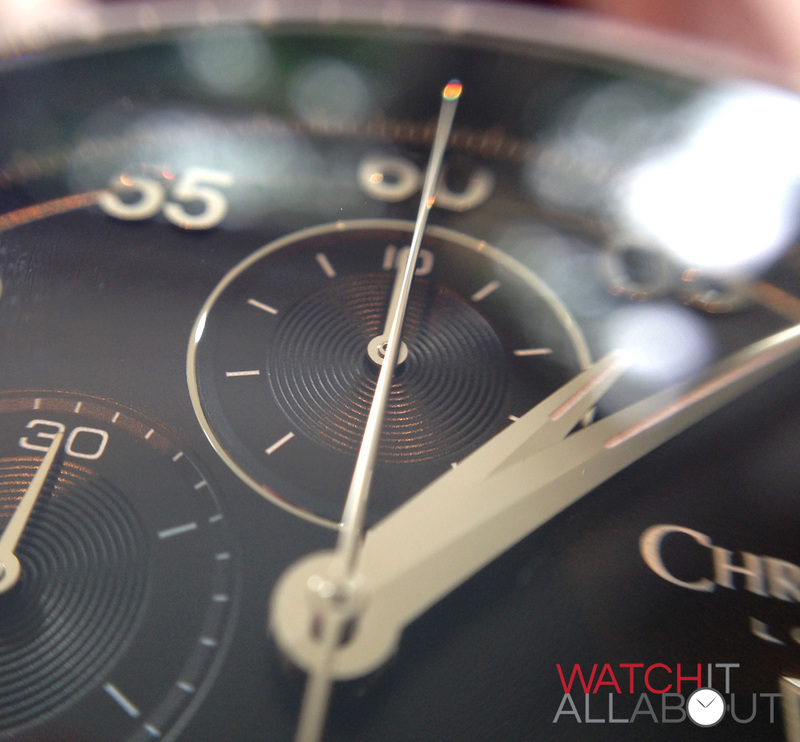 The C7 has a Swiss Made Ronda 3540.D quartz movement. It has 5 jewels in it and a 54 month battery life. A cool function is that if you leave the stem pulled out, it enters a battery saving mode, which reduces consumption by 70%. 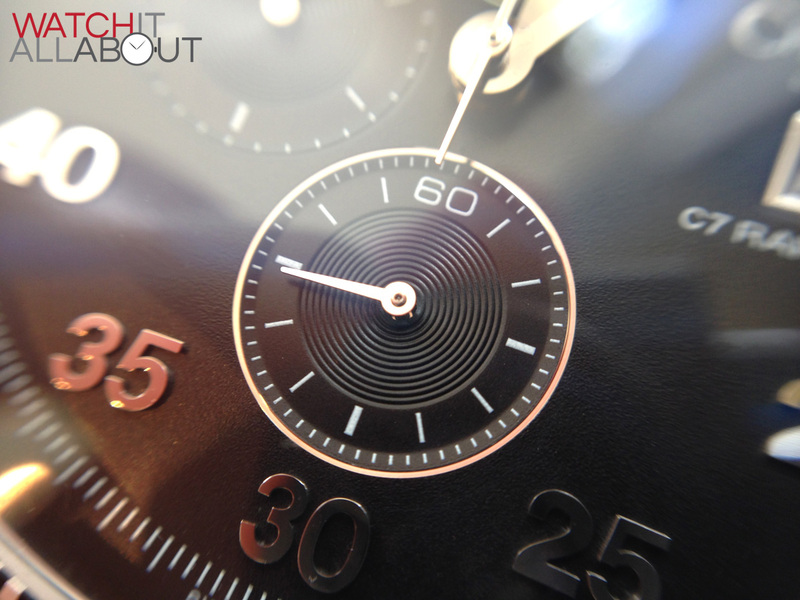 The bottom subdial is the running seconds, and the big seconds hand is the chronograph seconds. 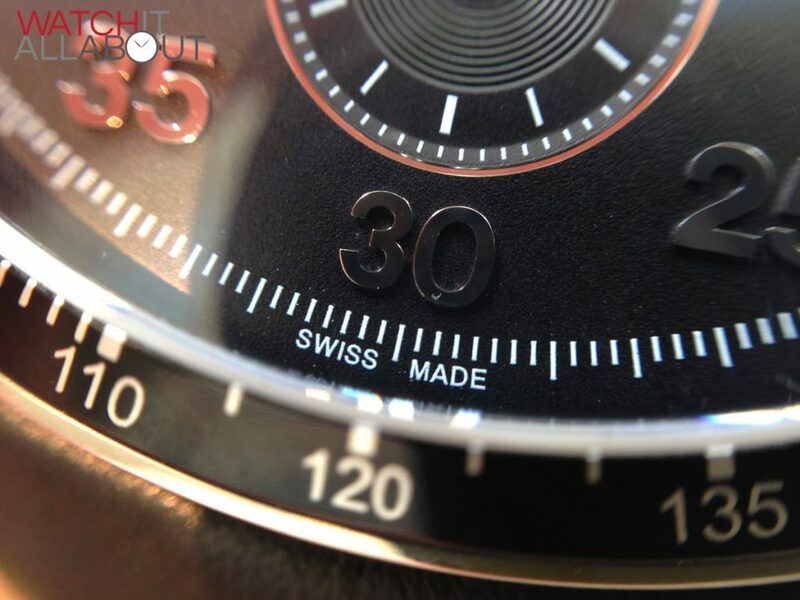 The left subdial is a 30 minute counter, and the top subdial has a double function. It acts as a 1/10th of a second indicator for the first 30 minutes (spins around once every second), and then after that it acts as a 10 hour counter for the chrono. 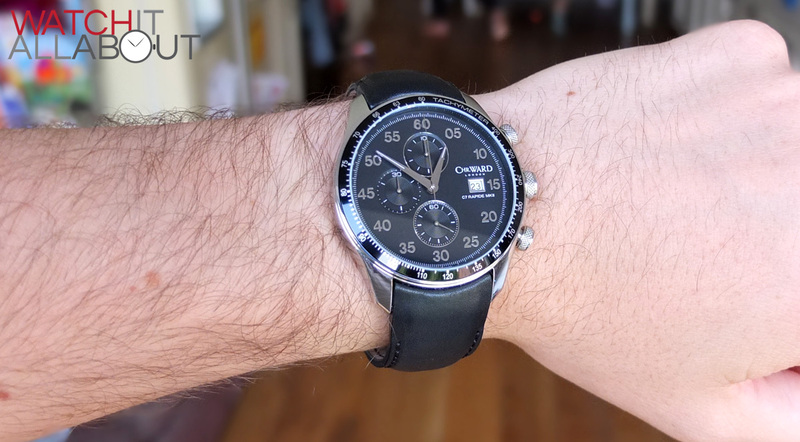 So in this same watch you can measure from 1/10th of a second all the way to 10 hours! I’m pretty sure that covers everything you’ll ever need, which is pretty impressive. 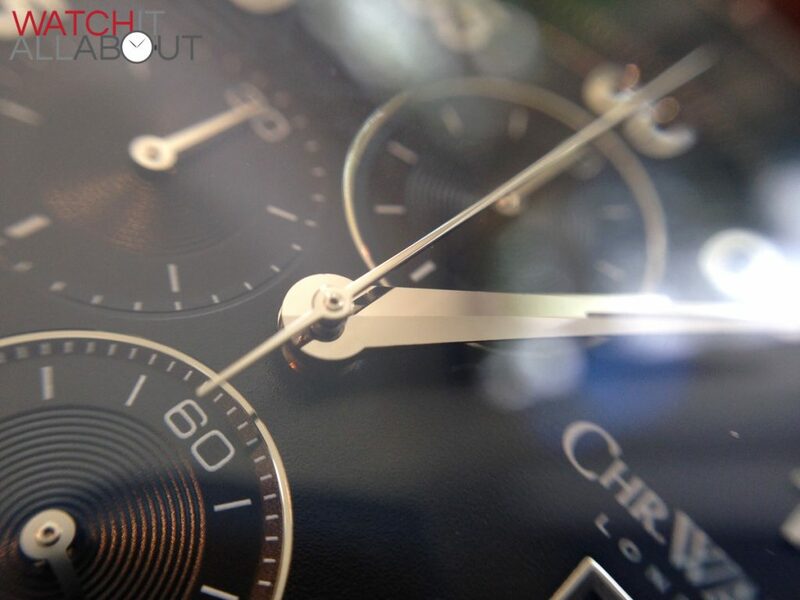 The real stand out feature of the C7 is the applied polished stainless steel numeral hour markers. 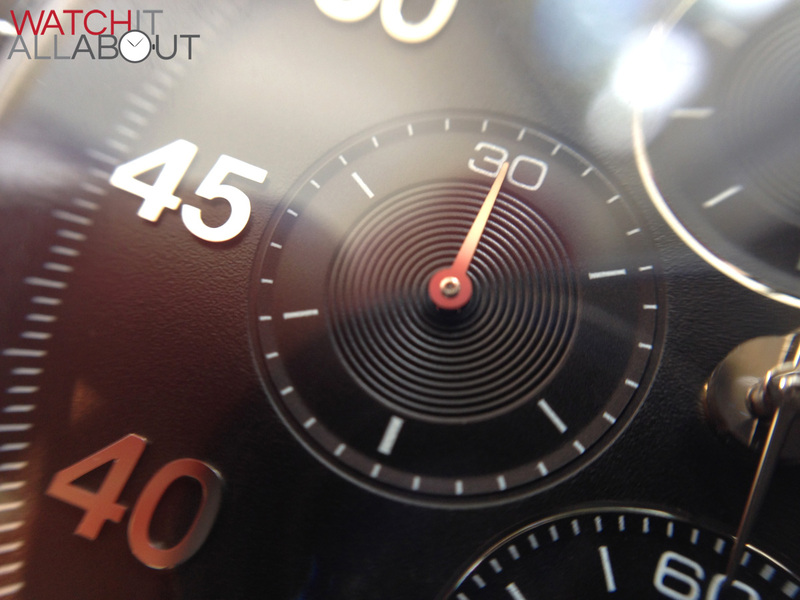 Even though they are hour markers, they actually function more for minute counting, as they show every 5 minutes as does the Carrera. This is another reference to the Tag, and also to it being a sports watch (better for using the chrono if you have minute markers). The numerals are all stunning to look at, impeccably made and stuck on perfectly (none are wonky). 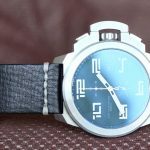 This really is something that makes this watch stand out at this price range. As you would expect, the printing on the dial is all flawless too. There is a printed minute track around the outside which is just the right size, not too overbearing, but still visible. 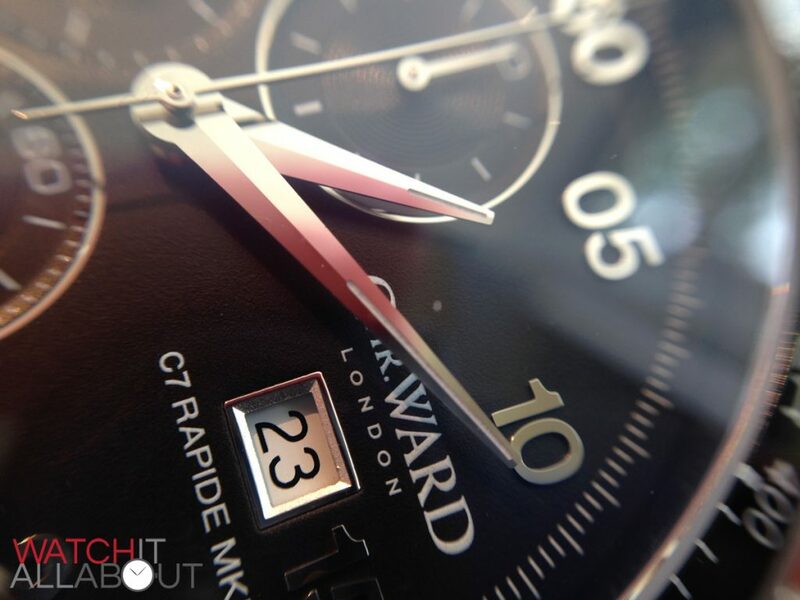 The Christopher Ward logo and “C7 Rapide MK2” are printed above and below the date positioned at 3. The date wheel itself is white with black text, it may have looked a bit nicer the other way around. 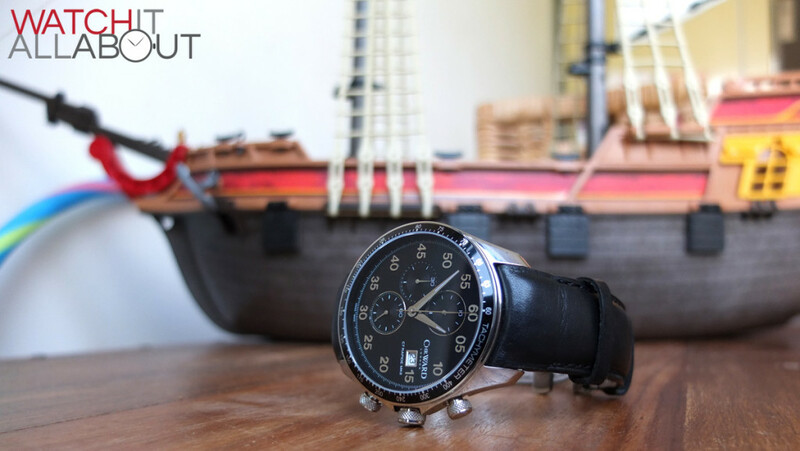 It has an extremely high class and well made stainless steel frame around it, as on the C60 Trident. This is something that could have easily been left off, with just a square being punched into the dial. 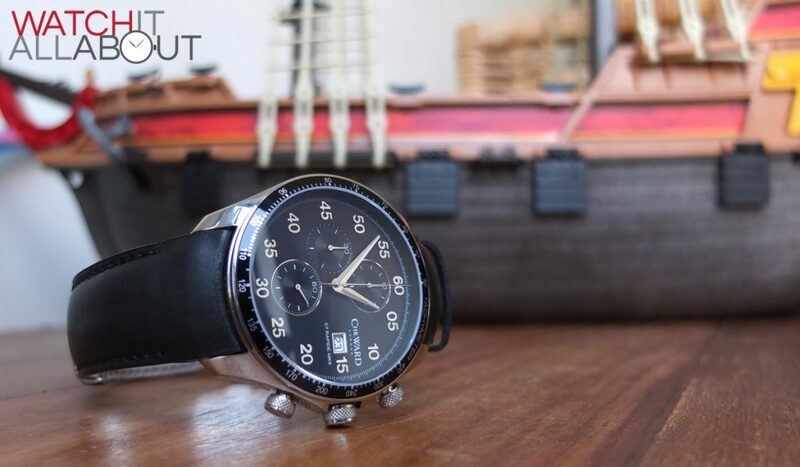 But the extra effort here once again shows the high quality of the watch for the price. 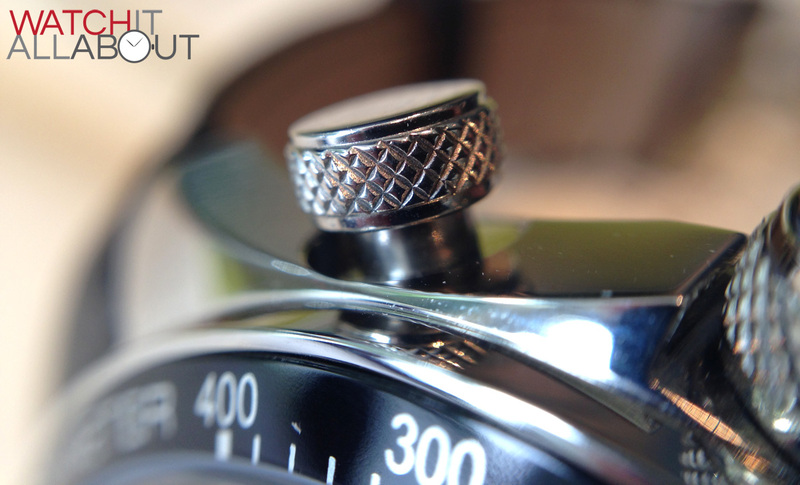 To give the dial an extra bit of texture, there are concentric circle patterns in the centres of the subdials, and the top and bottom subdials have a thin stainless steel border around them. 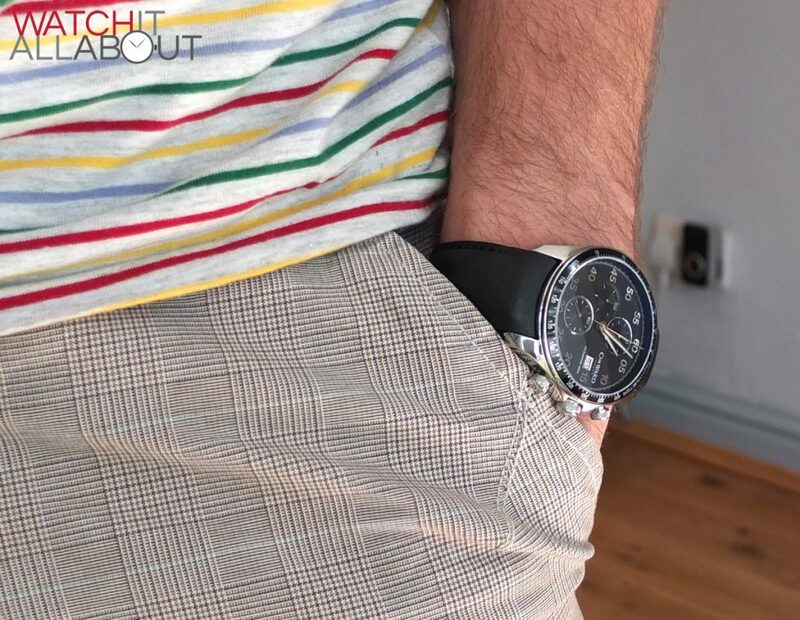 Again, not necessary, and an extra expense, and also extremely subtle, but the fact that Christopher Ward included these in show the though and effort that has gone into making these. 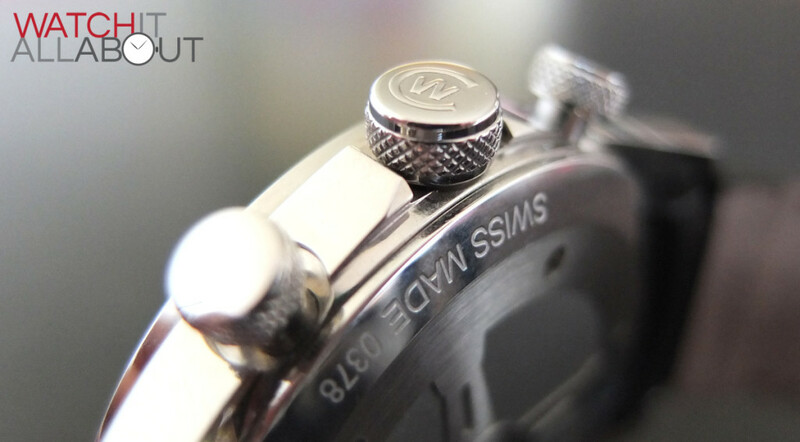 These little bits of extra finishing and detailing are not something you would usually see on a watch of this price. Looking at the hands – the subdials and big seconds are all very thin points made of polished stainless steel, with no lume on. The hour and minute hands are thin arrows with the tiniest bit of rubbish lume on – which in turn is the only lume on the face! 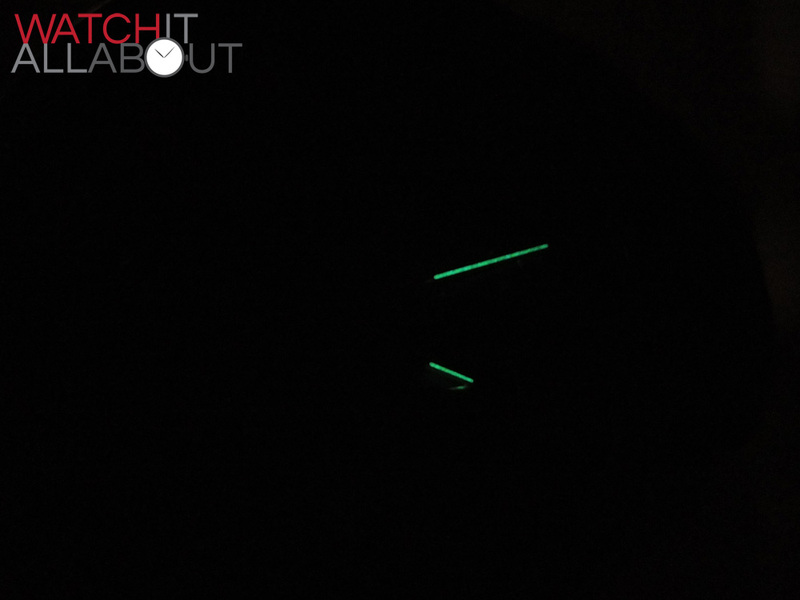 The lume is quite poor unfortunately, the watch is not really visible in the dark at all. 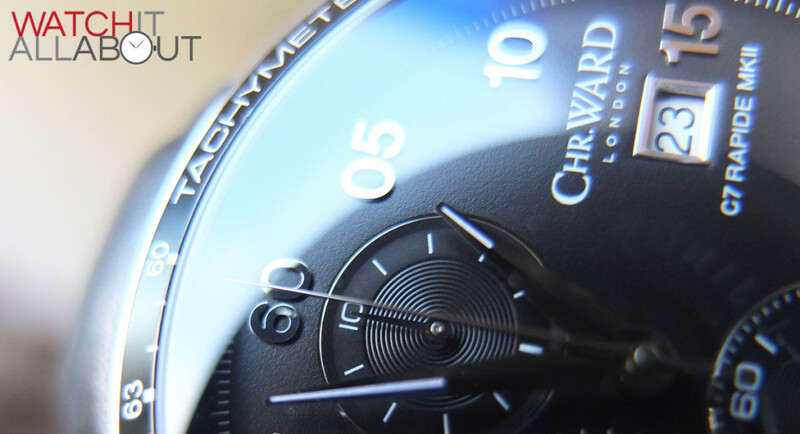 This is one of the main problems Christopher Ward have – the lume is much poorer than any of their competitors. The overall appearance of the dial is awesome. Some people may complain about the fact that due to it being a quartz movement, the subdials may look like they are too close together. But when you have it on, you cannot tell. The design has definitely been thought through – thanks to the applied numerals, they fill the extra space around the edge very well. 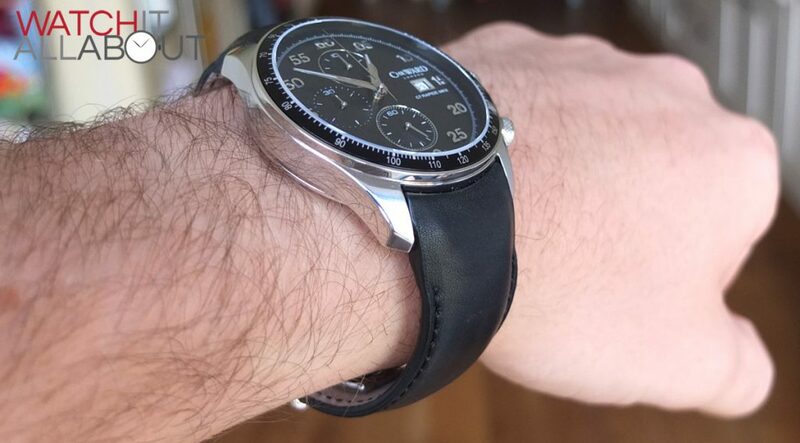 The 22mm wide strap is made of very soft plain black leather, namely Christopher Ward’s “Toro Bravo” Spanish leather. It is very plain and understated, as it also has black stitching. Personally, I would have preferred a colour stitch (even just white) to enhance the sport look it is going for. 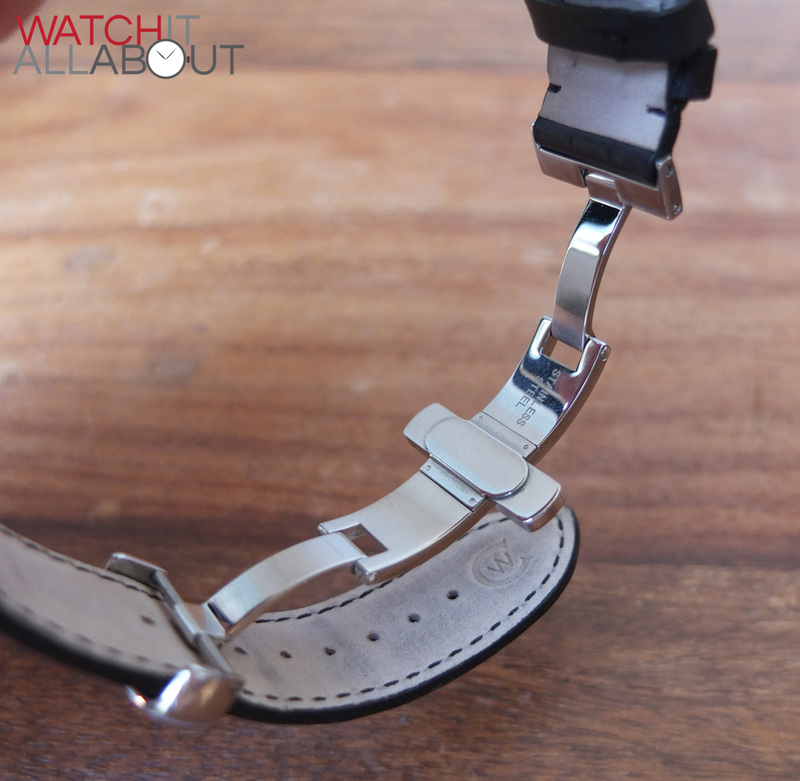 That being said, the very plain strap means that your sole focus is upon the watch itself, which isn’t a bad thing! 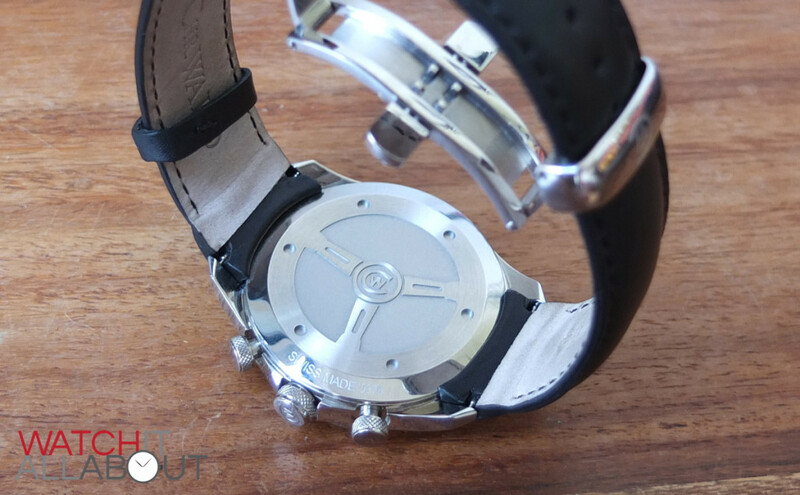 There is the standard Christopher Ward butterfly clasp fitted, with a polished stainless steel buckle with the CW logo deeply etched on the top. It is sturdy and very reliable. I have never experienced any problems with these ever. There is one small problem, which I believe is just mine – there is a really itchy bit on the back of one of the strap loops. It seems to be from the stitching behind not being made good. 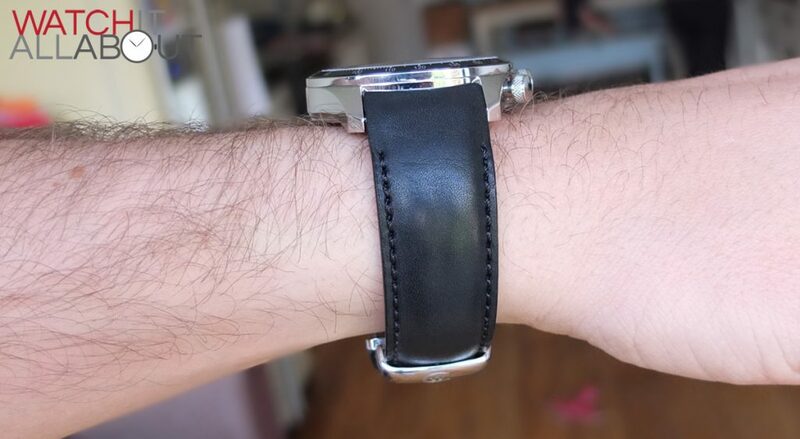 It doesn’t always irritate, but sometimes I really notice it scraping the inside of my wrist. I’m sure it isn’t a problem on all the C7 mk2 straps, but worth a mention. All in all though, the leather is high quality and supple, and apart from the scratchy stitch, very soft and comfortable to wear. It balances the weight of the watch very well. An affordable Tag Carerra Homage? 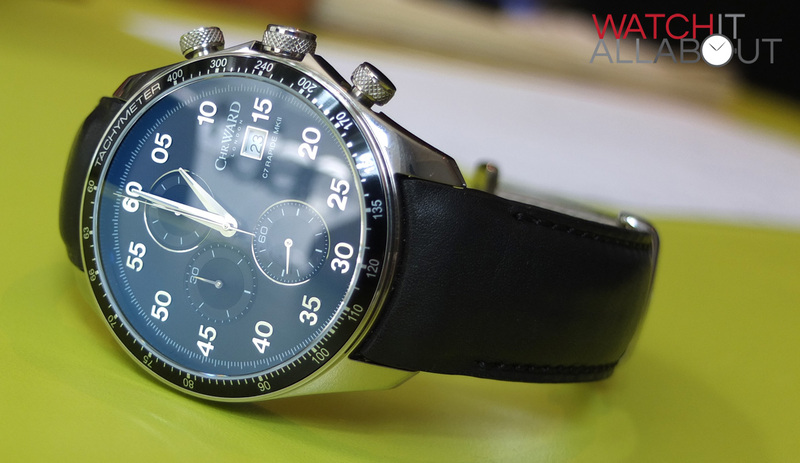 Well, does it compare to the Tag Heuer Carrera? In looks, it certainly takes some design cues from it (mainly the applied numerals, which are also my favourite part about it). 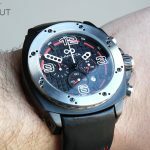 In quality, it would be unfair to compare two watches where one is 10 times more expensive. 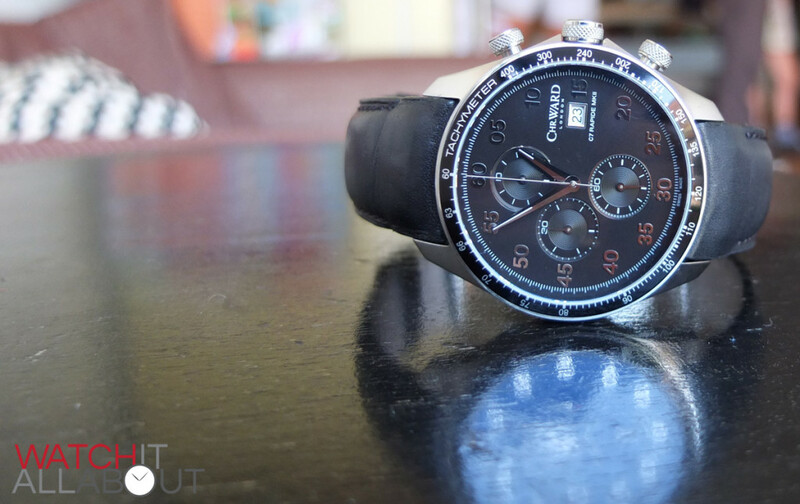 But that being said, the Christopher Ward C7 mk2 is a stunning watch for the money and stands out amongst others of a similar price. The quality, the specs, the finish, and the gorgeous design for £300 is just brilliant. 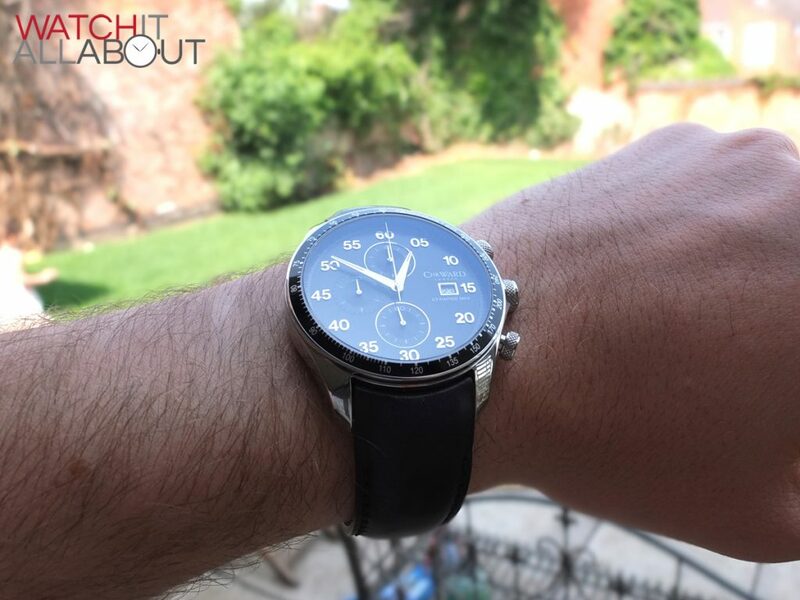 I am a real fan boy of Christopher Ward (if you haven’t guessed already), mainly due to the fact that they are bring luxury watch quality to the people who can’t afford £1000’s. The C7 mk2 is no exception. 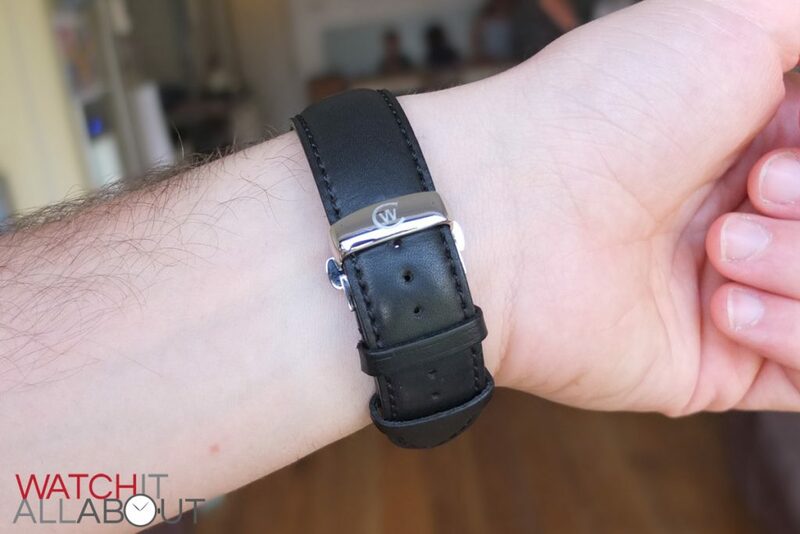 When it’s on the wrist, it looks classy and feels quality. 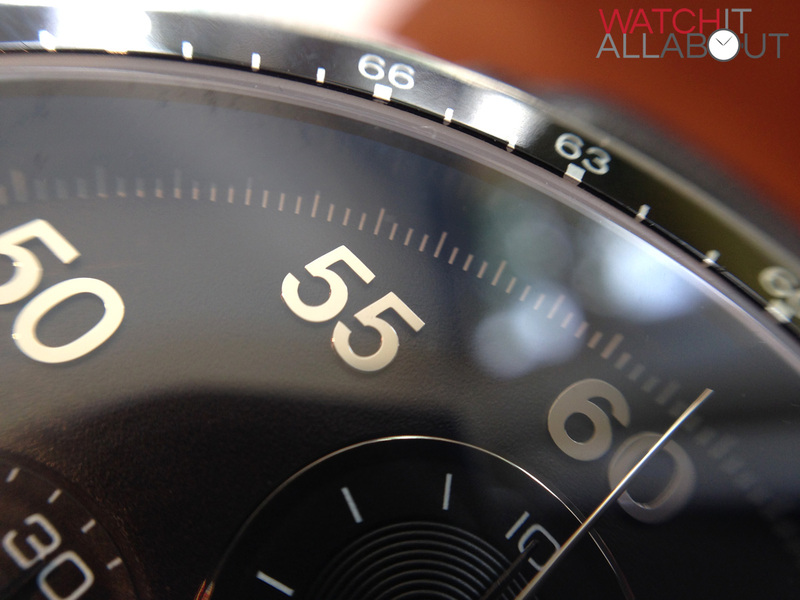 The reflections from the polished stainless steel of the numerals, hands and subdial surrounds catch the eye. 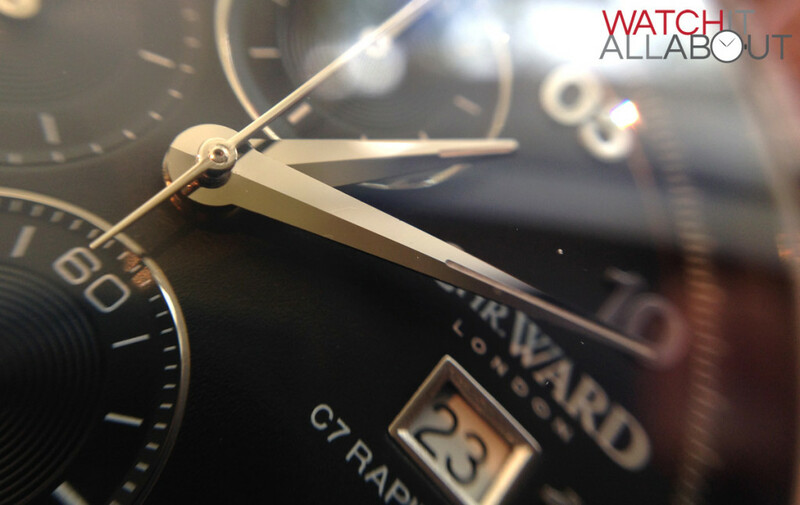 As well as the C60 Trident, it’s definitely one of my favourite Christopher Ward’s! It was also a joy and so easy to photograph – any angle, any reflection, any light – it looks great. I personally love it and highly recommend it! If the design also calls out to you, don’t hesitate to buy it. 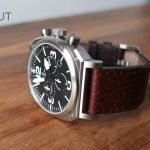 Great review, I’ve got the version with the steel bracelet and baton markers (these have lume on the hour markers) and I love mine. 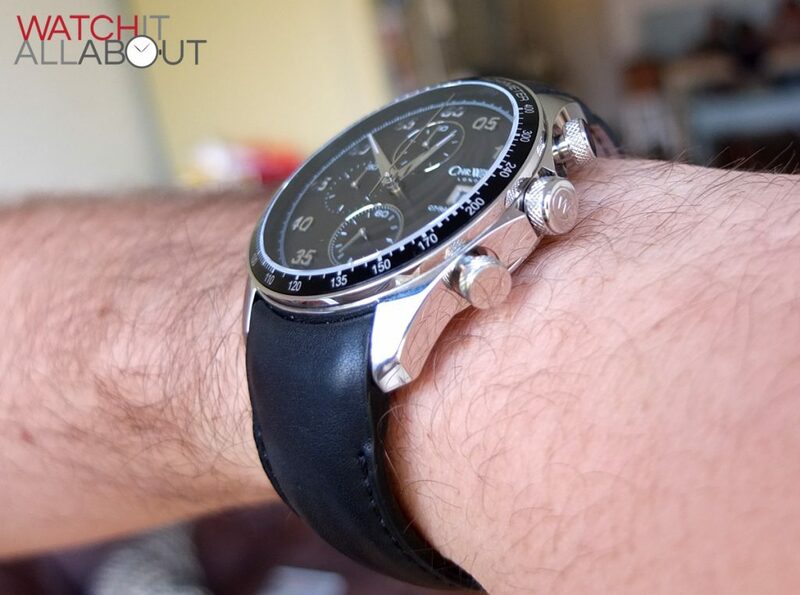 Didn’t know about the energy saving and 10-hour chronograph features until I read your review. 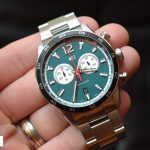 Definitely agree about the lume, seems to fade ridiculously quickly, but this seems to be an issue with all watches that use Super-Luminova. That being said, still a great watch and definitely an accurate, thorough review! I recently received one of these but noted something odd, which isn’t addressed in the manual, but which the video hints at in passing. When the stop watch function starts, the tenths-of-a-second hand spins (very quickly of course) while the center stop second hand begins turning as well. When the center stop second hand gets to the 30 second mark, the tenths-second hand stops turning at the “high noon” position. If I then stop the time, the tenths-of-a-second hand will move to a point on its dial and stop. My questions are whether this is normal? (The video mentions that after 30 minutes the tenths hand turns into an hour counter.) When I contacted a rep at the CW company, I was only told I should return it for examination, which I don’t want to do if this is normal. If anyone knows, thanks much.